Innovation of nursing record keeping processes and systems is needed to improve patient safety and care. 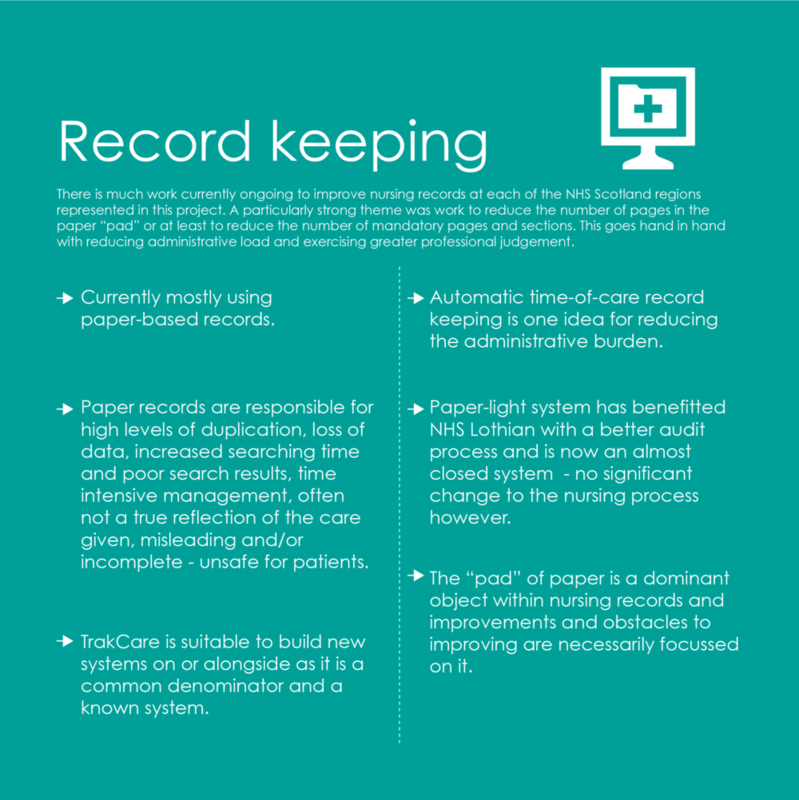 Almost all of the NHS Scotland regions use paper-based nursing records, which causes problems such as loss of information, poor quality recording of care and lack of access to existing patient information. It also creates a large administrative overhead. This is against the well-understood backdrop of chronic underfunding and understaffing within the NHS. 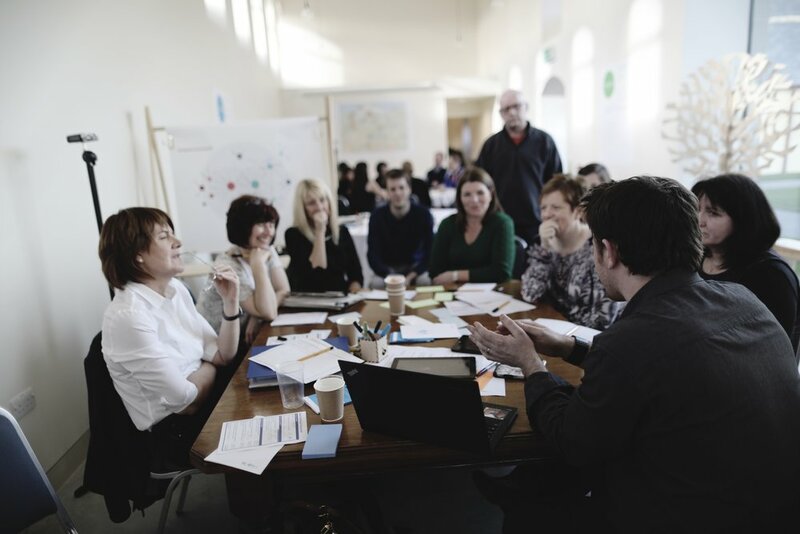 An Experience Lab was held following several interviews with senior nursing staff to scope the current issues and existing improvement work around nursing. 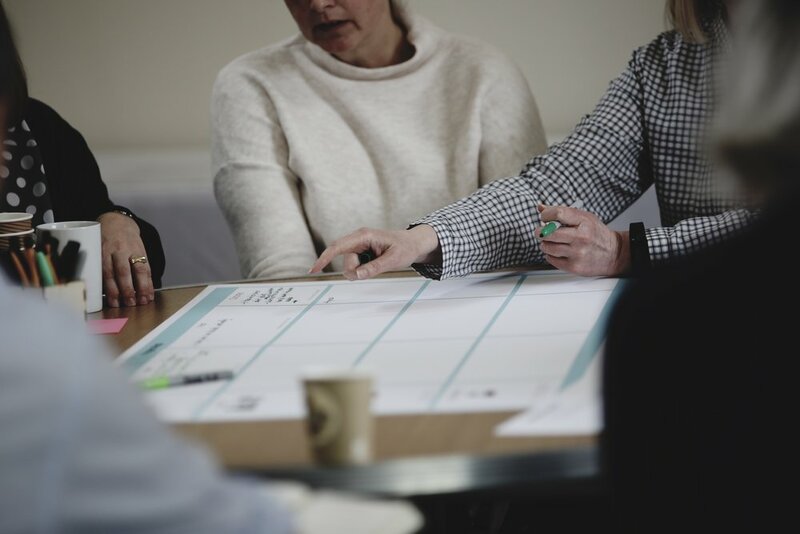 The Lab helped us move towards a group consensus on what innovative technologies may be suitable to help nursing staff and how to make progress. 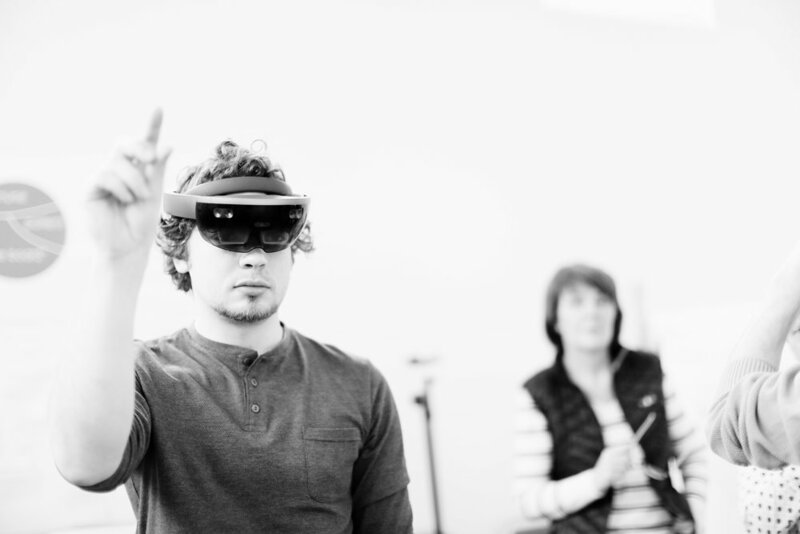 This report details the work and findings of the Experience Lab team. The primary finding of the Experience Lab is a desire and need to move to electronic health records (EHRs). 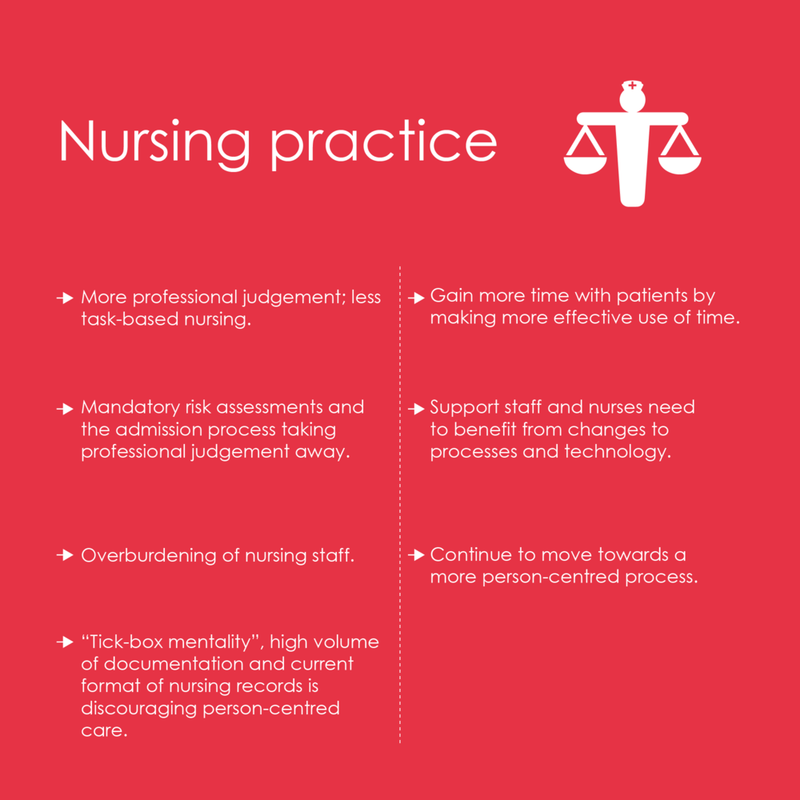 It is important that this should go hand-in-hand with work to increase the amount of professional judgement that nurses can use within care (as opposed to too many forms and task-based working). 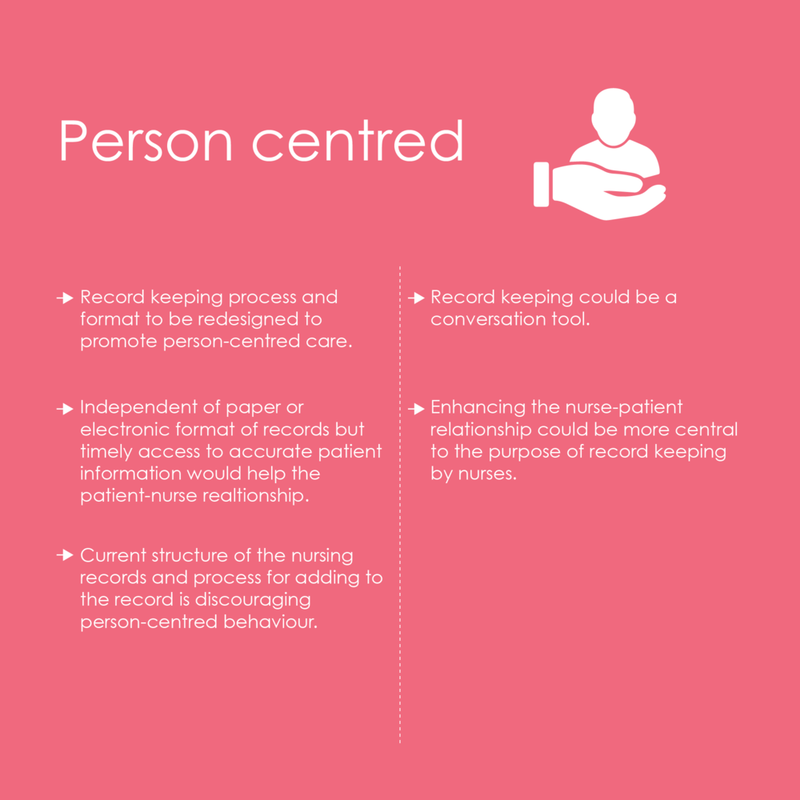 Ongoing work to make nursing records more person-centred should continue, with the obvious example being a move to a multidisciplinary record centred on the patient as a whole. A particular problem for nursing staff is that they work with their hands and so record keeping is often delayed until after the time of care. This delay can be significant and can compromise the integrity of the records system. 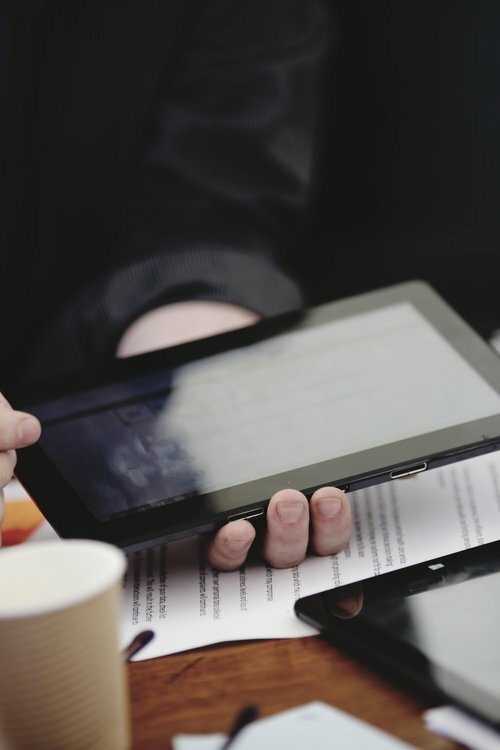 This is the case whether using paper or electronic record systems. We found no suitable existing solution for enabling time-of-care record keeping. Finally, the methods of progress within NHS Scotland’s regions are as important as the desired changes. 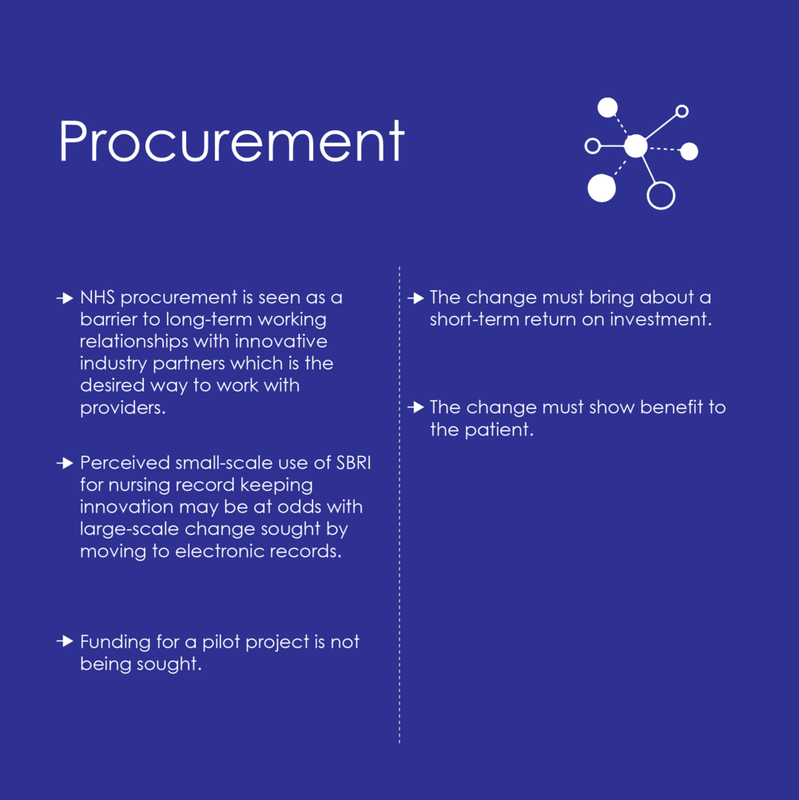 “One shot” procurement should be replaced as far as possible by pre-procurement working with industry, and ideally with long-term working relationships. Nurses spend a significant amount of time completing multiple admission forms, risk indicators and subsequent care plans. 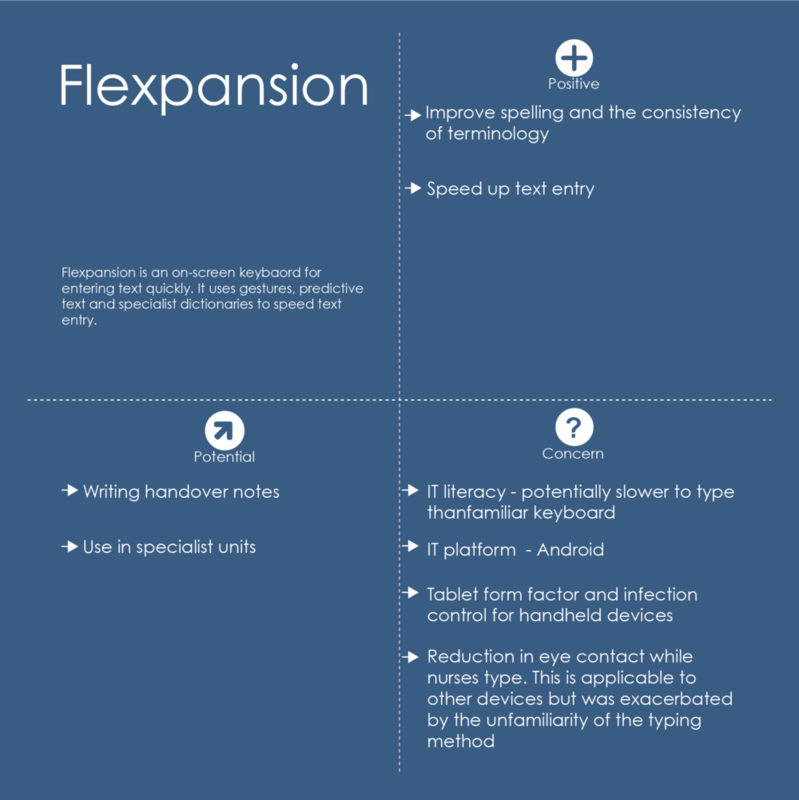 There can be issues around legibility, signatures and time of care recording of the data. Once this data has been captured it can often not be utilised or revisited. This data forms part of the legal document that is required by the Health Care organisation. 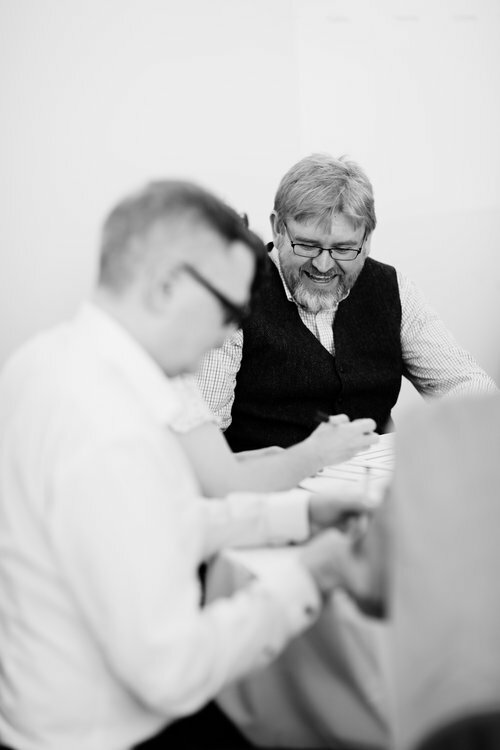 The process can be interpreted as ensuring everything is “filled in” so that the document is complete, rather than using it as a tool to see the person as an individual and using the information to form a key part of the patients care. Engaging with patients in a meaningful manner whilst undertaking this volume of documentation can often lose its meaning and value. To fully understand the issues we faced I engaged with the National Innovation team and challenged them to work with us to find a solution. 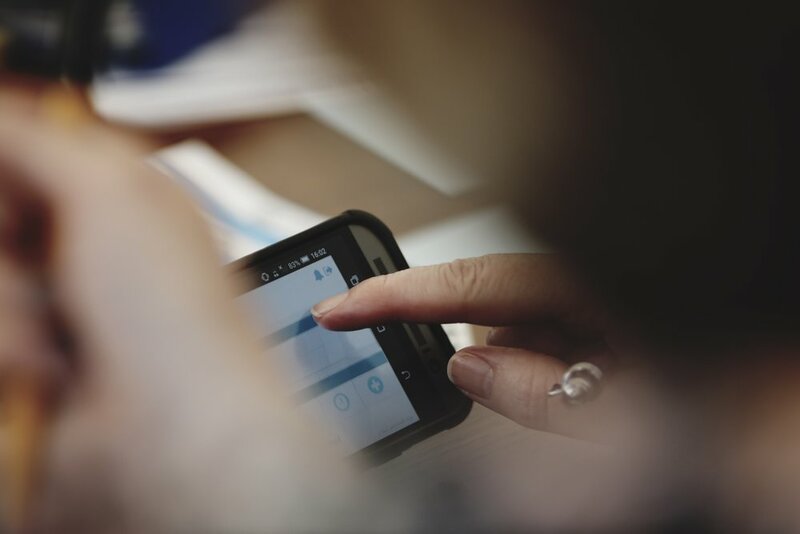 How can a nurse capture real time data including admission, continuous care and care planning whilst developing rapport with their patient? How can we capture data from the patient prior to admission and enable patients to access relevant information post discharge? 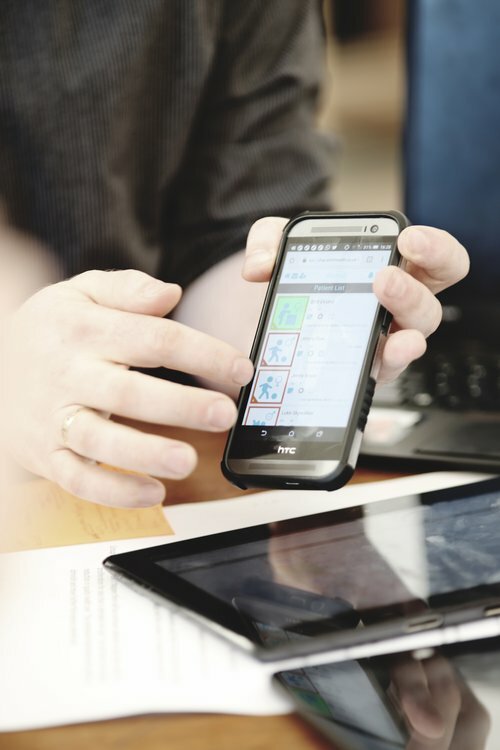 This innovation challenge seeks to ultimately create an effective system to capture data from the clinical conversation and store it in a structured format within an electronic health record. 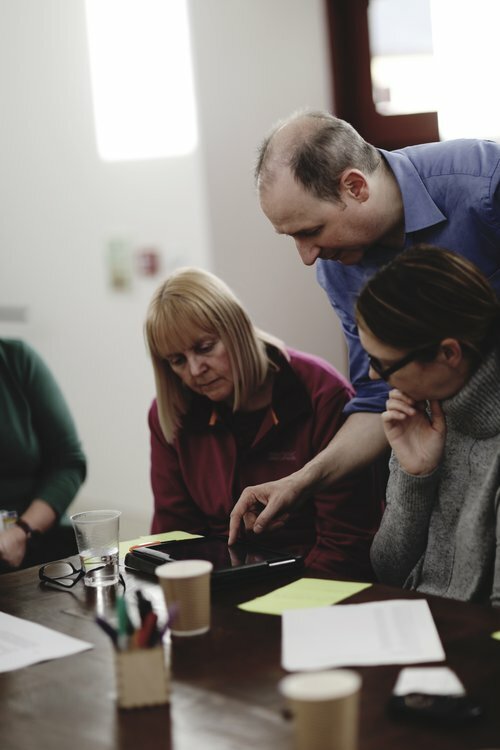 Initially, working with the National Innovation Unit we undertook a workshop with local NHS Grampian clinical and e-health staff, members from the Chief Nursing Office for Scotland, industry partners as well as national e-Health colleagues. We undertook a Gap Leap Analysis enabling us to identify the difference between where we are and where we would like to be. 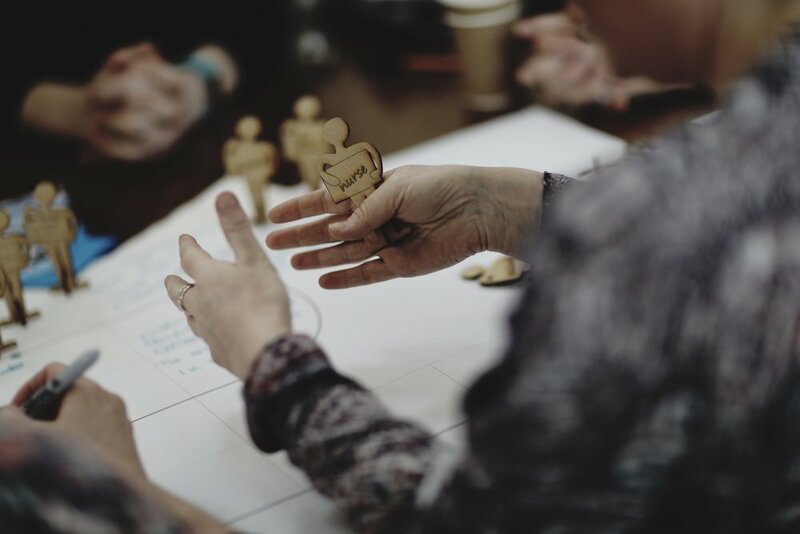 One group suggested the gap was that the “system is ‘designed’ around professions workflow and tasks not around the individual patients and clients”. We discussed what would it look like if it was fixed and why it had not been fixed to date. The next stage was to understand if colleagues nationally faced the same challenges as we did and to investigate if a solution existed. Glasgow School of Art were commissioned to take this forward. Jay Bradley and Angela Tulloch were the leaders of the work and the authors of this report. The style used was that of the “Experience Lab” exploring whether there was already a product available or did we need to design it. The exercise and the results are fascinating, if not unsurprising. 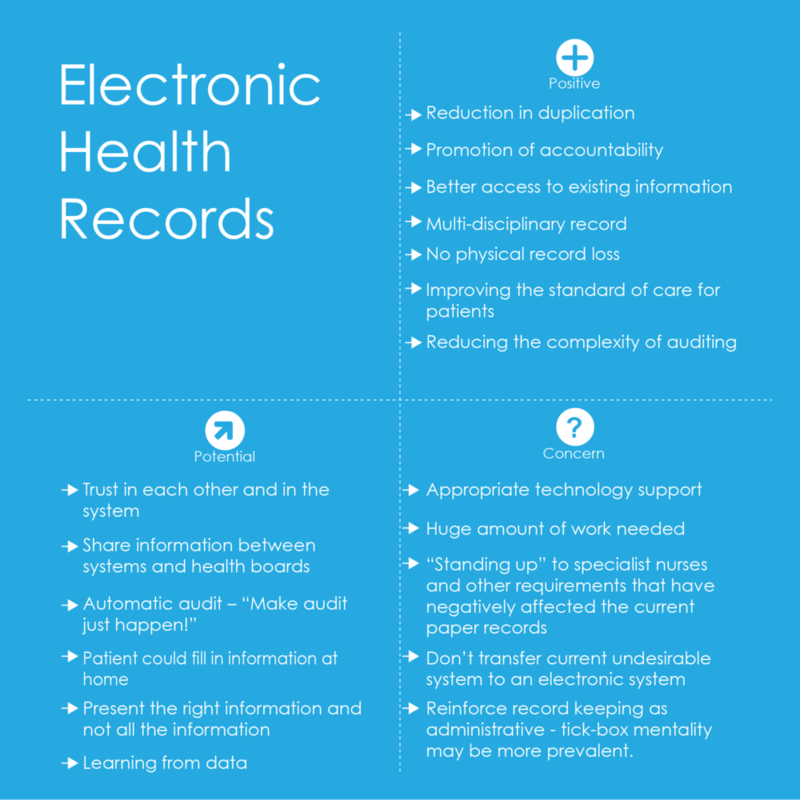 Record Keeping is a key part of patient care and if this can be achieved in a timelier, more efficient and person centred way it will add so much value to the health care journey. 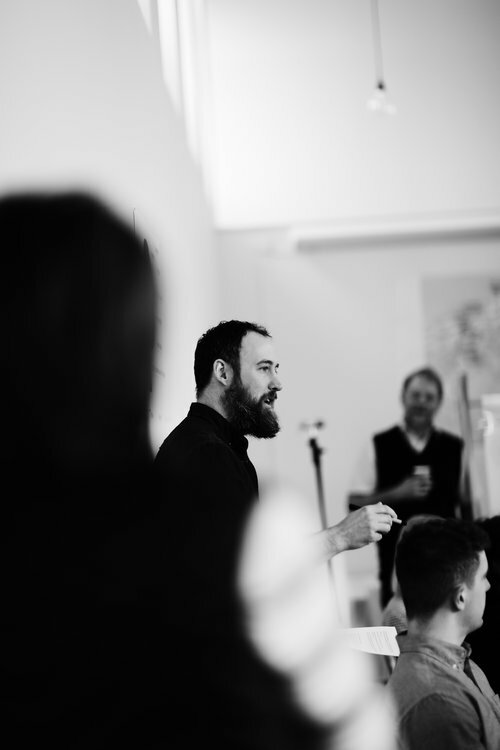 Experience Labs were developed by The Glasgow School of Art’s Institute of Design Innovation. 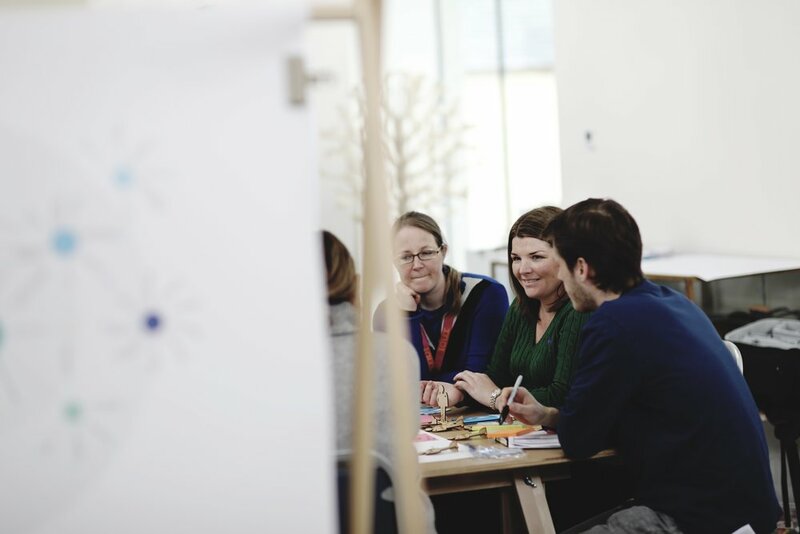 They offer a safe and creative environment where researchers, businesses, civic partners and service users can collaborate to find innovative solutions to the health and care challenges facing Scottish society. 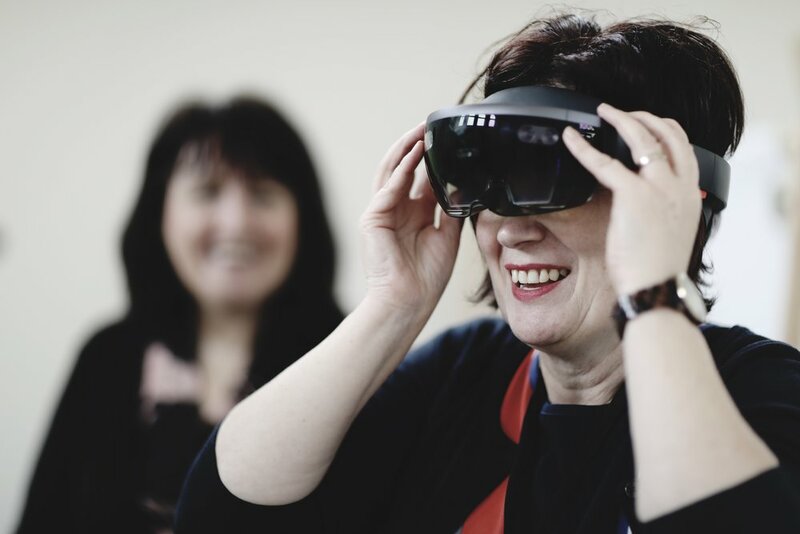 The Labs are the core element in the Digital Health & Care Institute (DHI), a Scottish Innovation Centre funded by the Scottish Funding Council, in partnership with Scottish Enterprise and Highlands and Islands Enterprise. 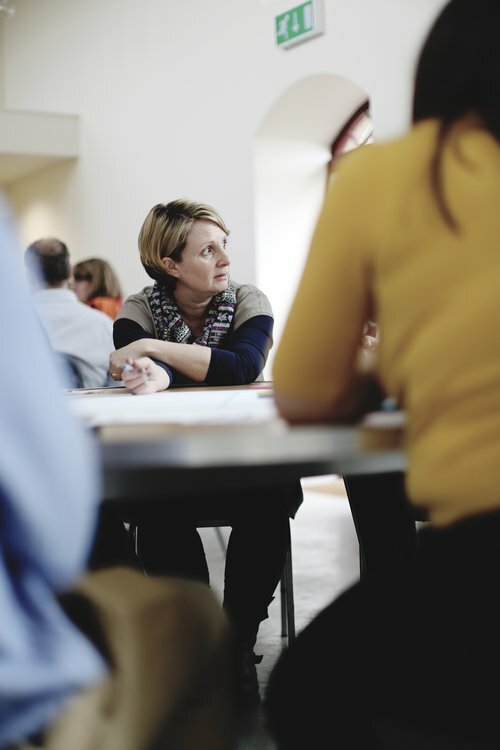 In the Experience Labs, researchers use current and emerging design research methods to engage with partners and participants, who are encouraged to share their own experiences. 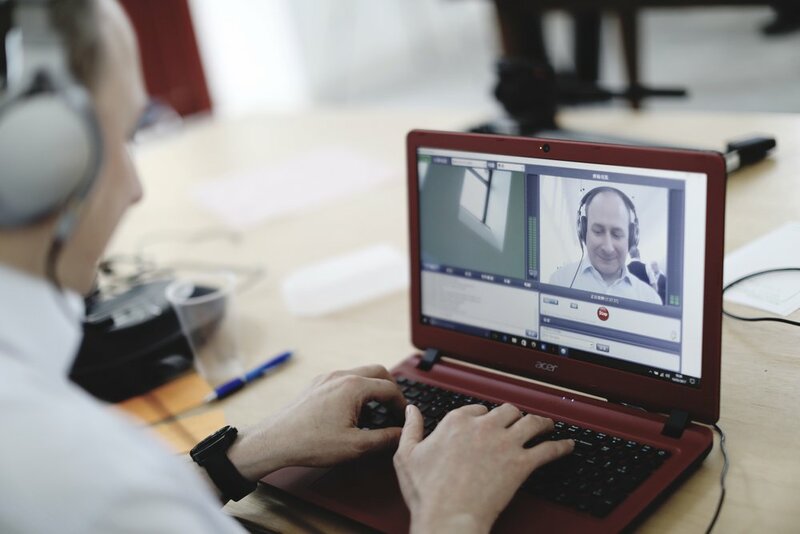 Real-life practice is often replicated to allow new technology, services, processes and behaviour to be trialled rapidly. 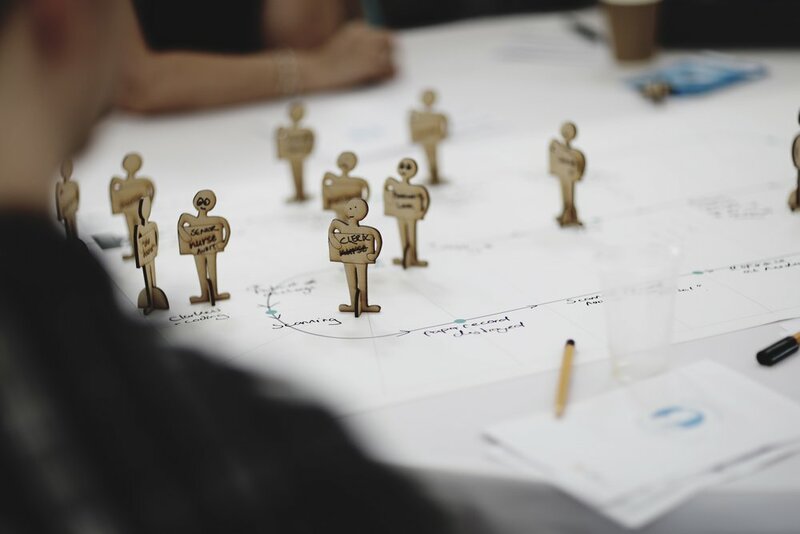 The resulting ideas become candidates for further research and development, allowing them to achieve their full potential. 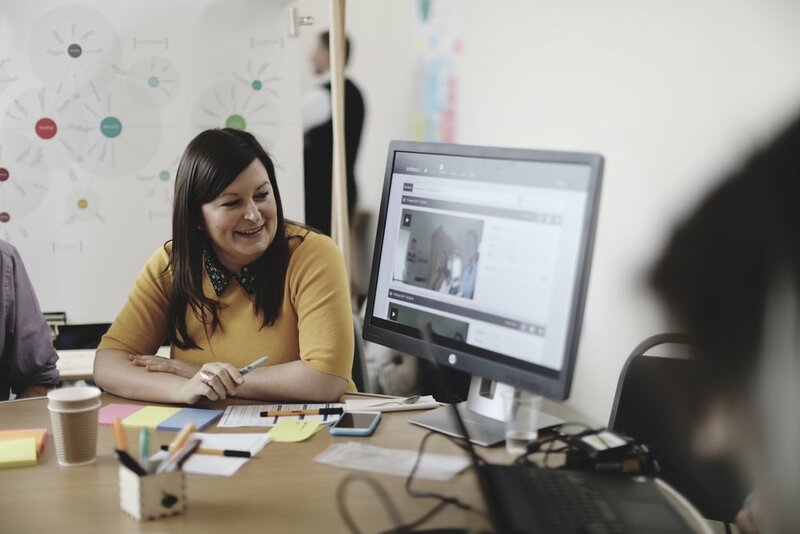 The Glasgow School of Art is a founding partner in the Digital Health & Care Institute, which is a partnership between NHS 24, Scottish Enterprise and Highlands and Islands Enterprise. 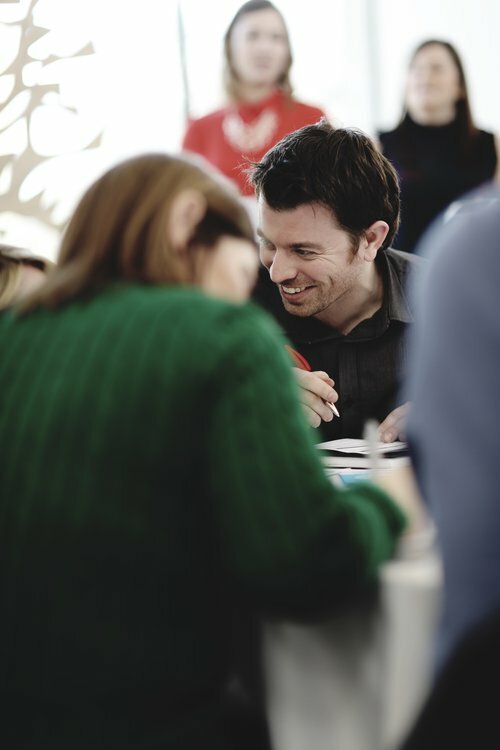 The DHI Innovation Centre creates an open community where industry can collaborate effectively with academia, health, care and social partners on innovation opportunities that will create societal and economic benefits in Scotland. The DHI will co-create sustainable economic growth through new products, services and systems. These solutions will generate high value health and social care solutions to the benefit of the people of Scotland and further afield. 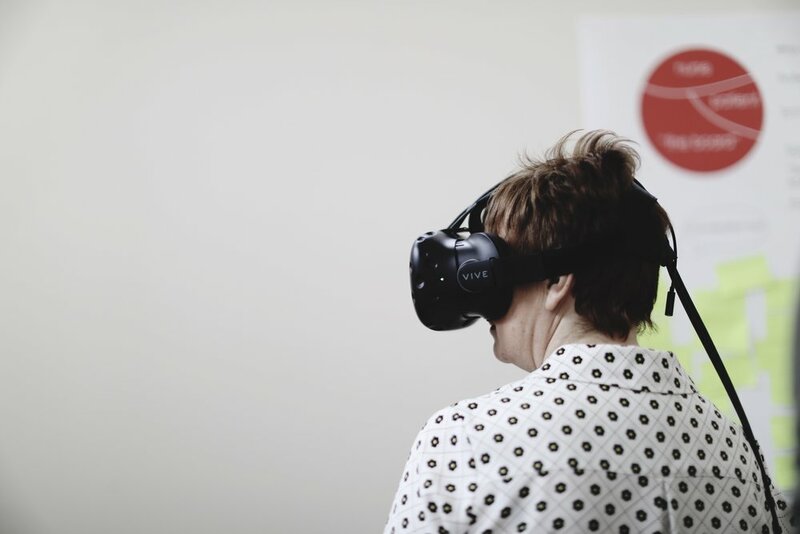 We would like to thank all of the interviewees, participants and industry partners for giving up their valuable time to participate in the Experience Lab. 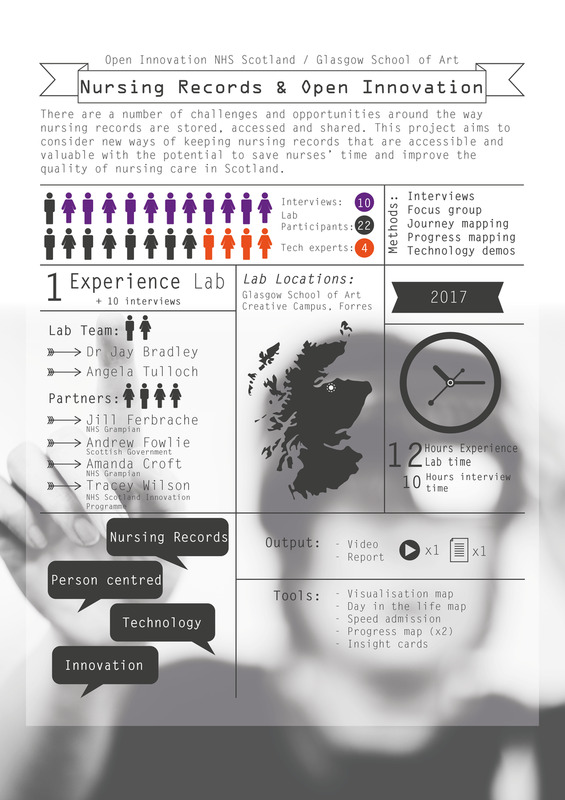 The nursing records project is a step in the patient safety project with Open Innovation NHS Scotland. 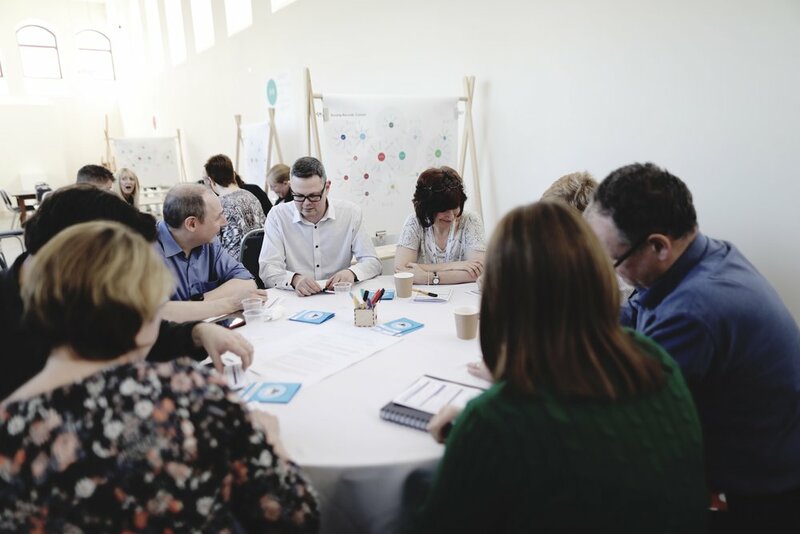 There was an initial workshop on 23 September 2016 hosted by NHS Grampian [Innovation Cluster, 2016]. 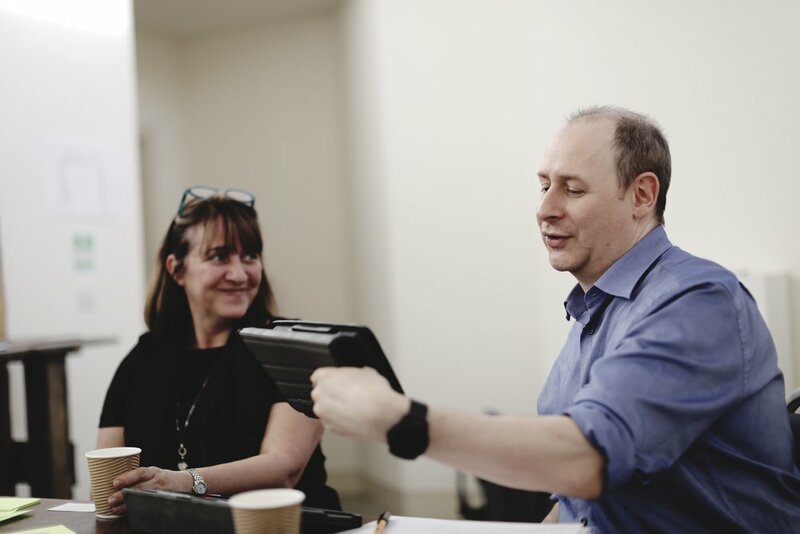 Following an invitation from Andrew Fowlie (Health and Care Innovations at Scottish Government), the Institute of Design Innovation at The Glasgow School of Art were asked to host an event to look at technology for improving nursing record keeping. We were asked to include industry partners that could be supported by the open innovation process in future. and to serve as a focal event to maintain enthusiasm and sustain current improvement effort within NHS Scotland. 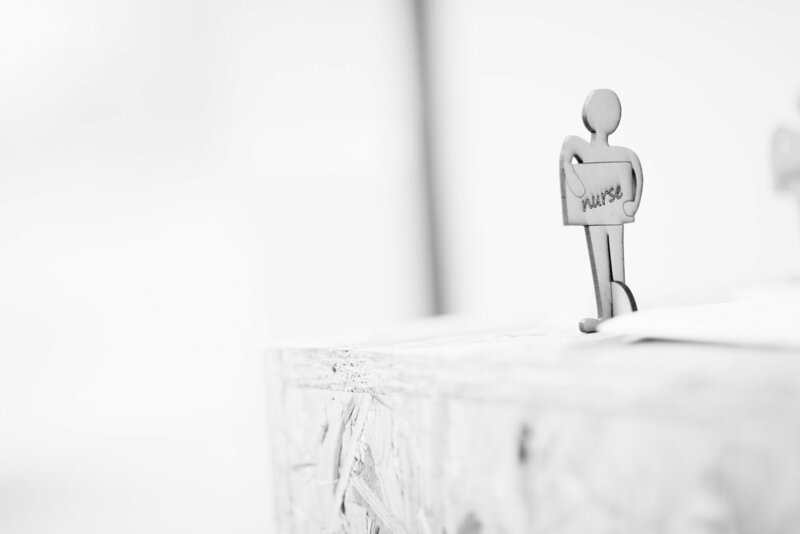 How can we reduce the administrative time currently taken when keeping records? How can we increase the value of the records kept? The interviews were semi-structured and the questions remained similar except where non-nursing staff were interviewed such as a GP, procurement staff or a consultant. 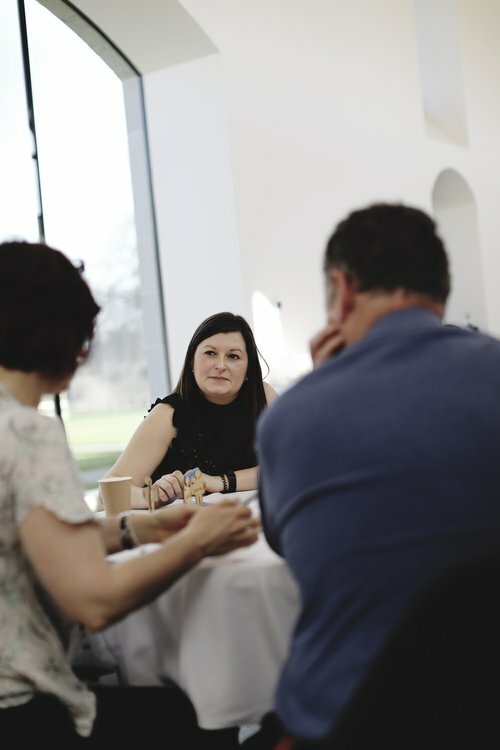 All interviews were conducted by two members of staff from the GSA involving a single interviewee, except the final interview with NHS Lanarkshire. 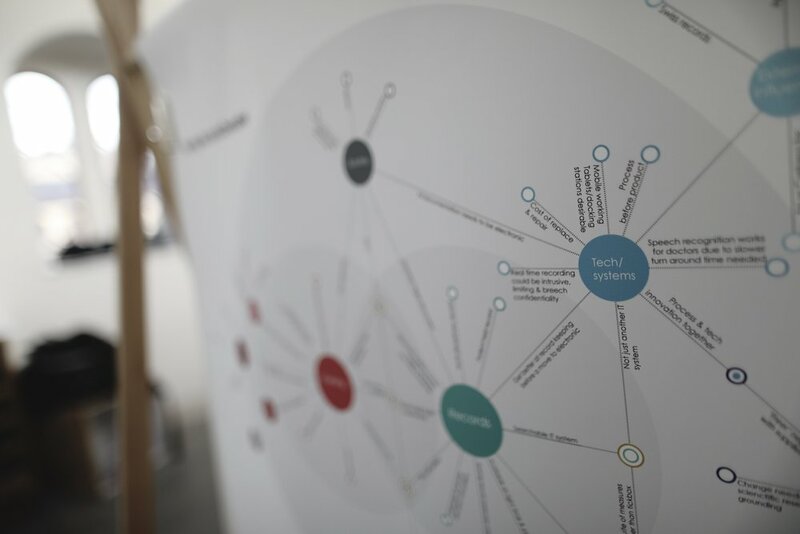 For this final session, the initial findings were presented as a visualisation of the current issues and the interviewees were asked to comment on it. 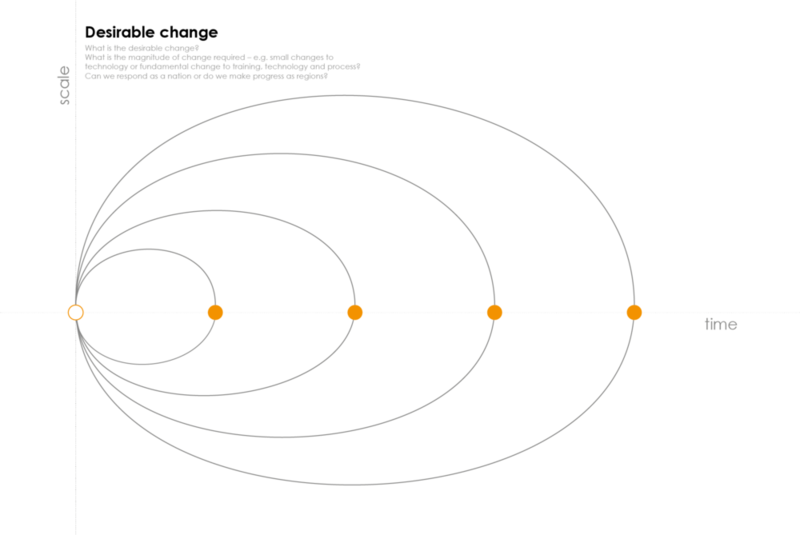 The visualisation was annotated during the interview. The interviews were recorded and the transcripts were used for thematic analysis. The identified themes are later presented as a visual map and accompanied by a text explanation. 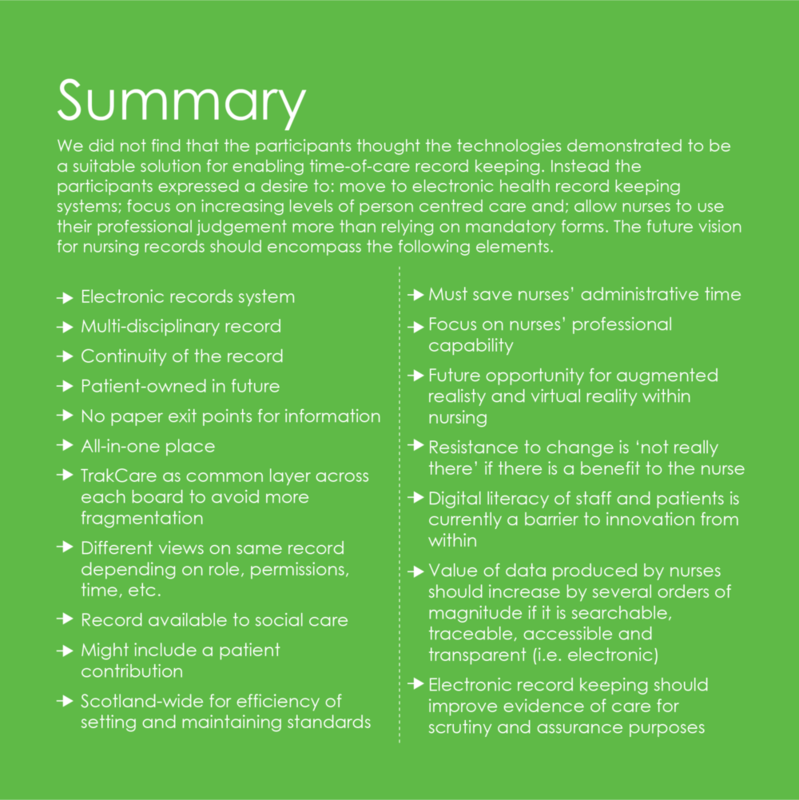 The themes fall in two broad areas: the current issues affecting nursing records and desirable future ideas. 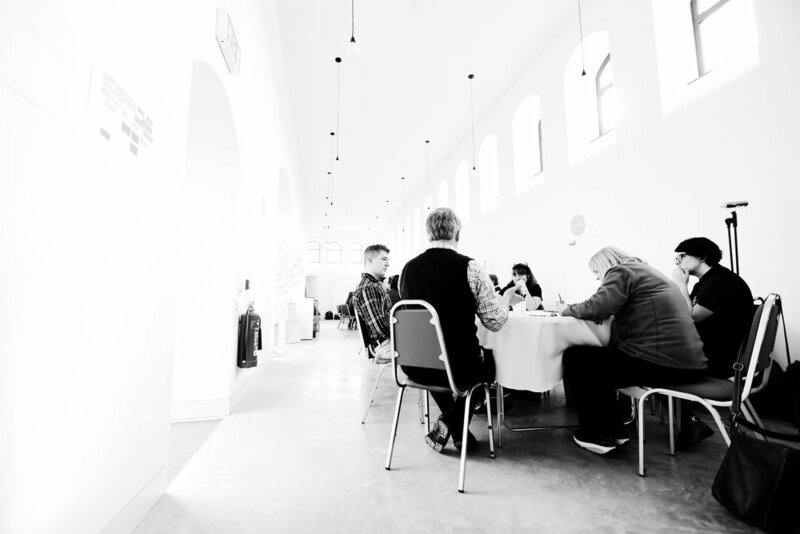 The insights from these interviews were then used to inform the activities of the Experience Lab. 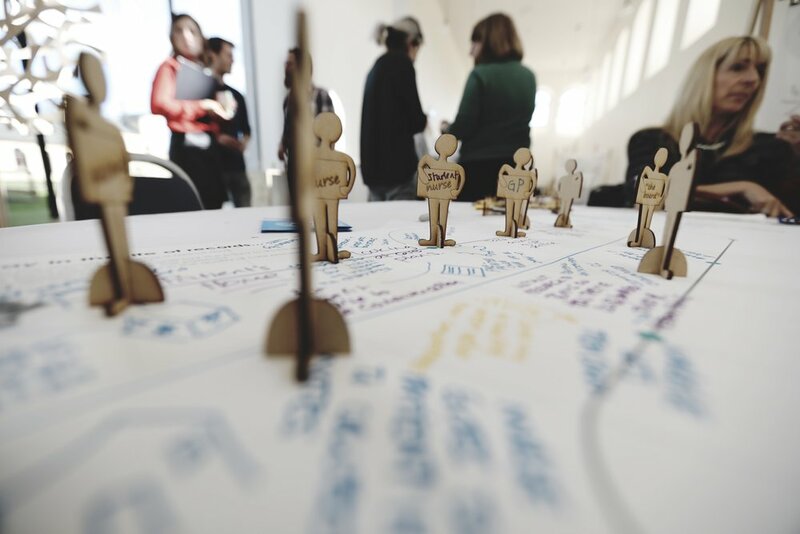 The 22 invited participants were affiliated with NHS Grampian, NHS Tayside, NHS Lanarkshire, NHS Highland, NHS Ayrshire and Arran, the Scottish Government and the four industry partners. 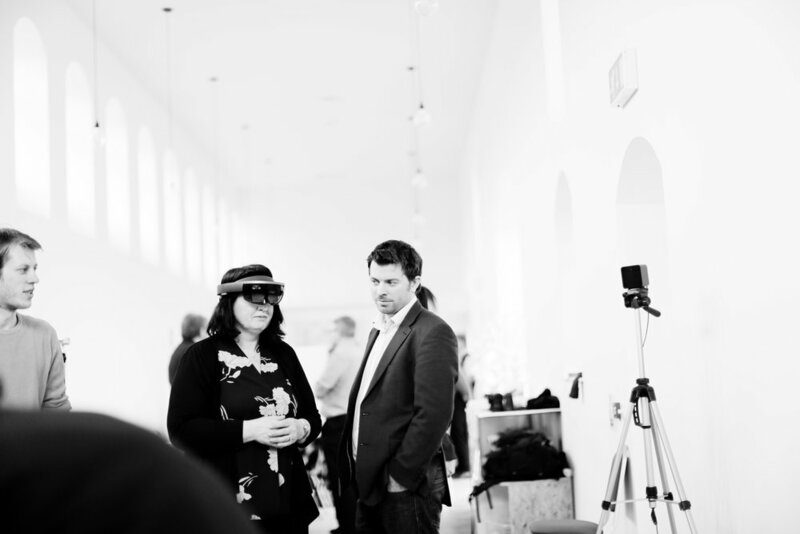 The Experience Lab was held at the GSA's Highlands and Islands Campus at Forres on 9-10 March 2017. Speed Admission was based on the concept of speed dating and was introduced as a warm-up activity. 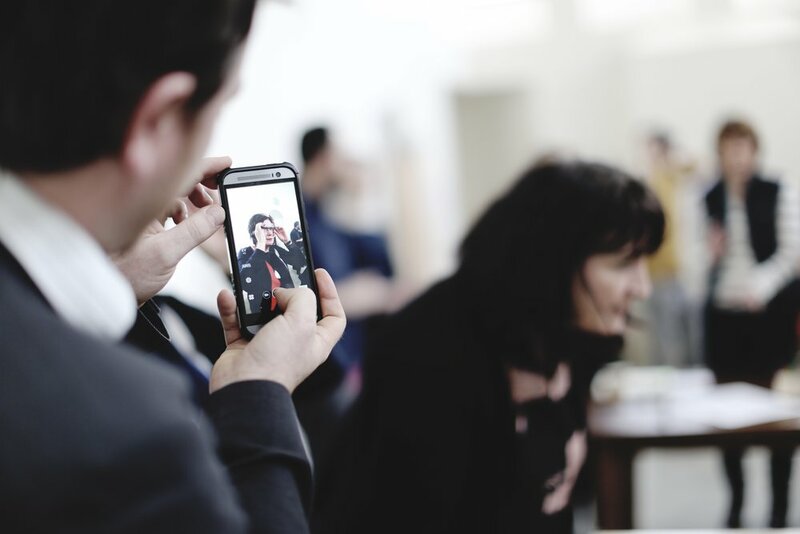 The aim was to allow participants a quick way to introduce themselves, give industry visitors an experience of paper based records as well as collect some opinions based on the interviews. 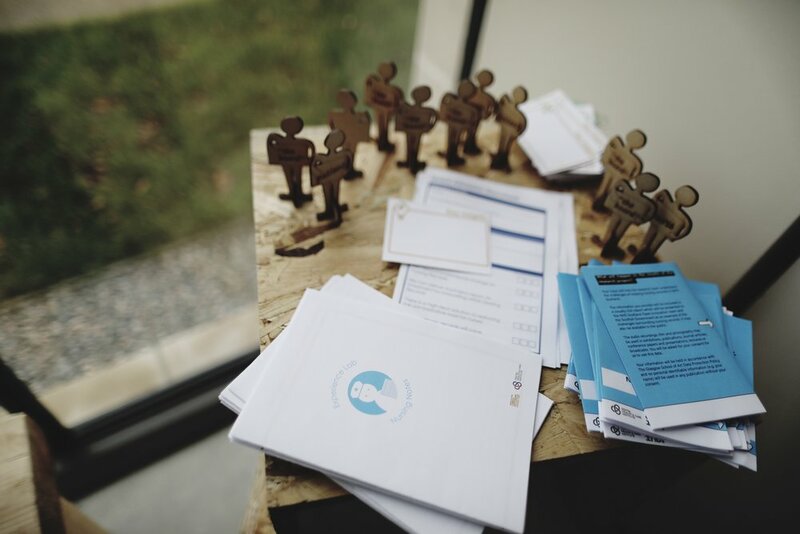 An A5 booklet was provided to each participant – this tool resembled an admission form and asked for information such as name, job title, etc., as well as space for free text and a tick box section. Participants were asked to pair up and given two minutes to “admit” each other into the Lab by completing the admission document. Participants were then asked to move a total of four times to the next person and repeat the activity. Working in small groups with a researcher, participants were asked to consider the typical journey of a nursing record document over the course of a day. What purpose do they serve? Who are the records for? Who interacts with the record? 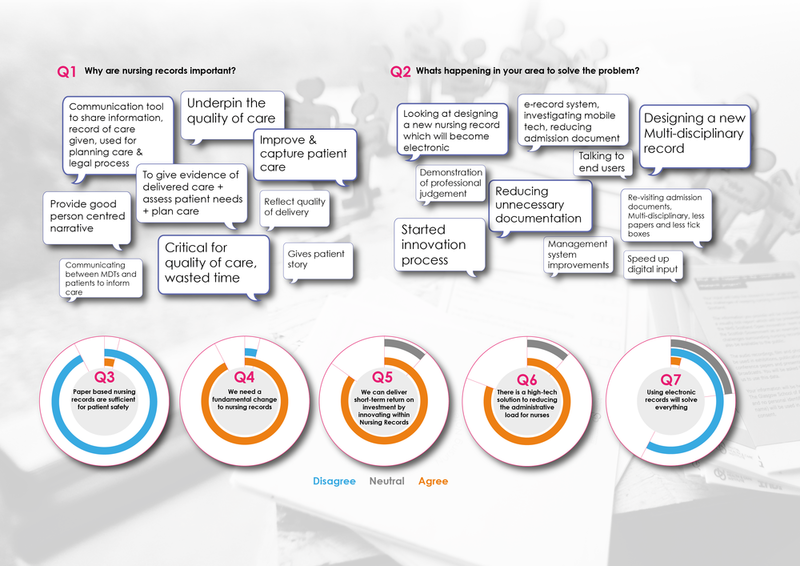 What role do the records play in the quality of care process? Thinking about the different moments of interaction from the perspective of the record and the elements that were most important, participants were asked to illustrate that journey using a timeline template and wooden figures which represented various stakeholders such as patients, nurses, doctors and governance bodies to capture each touchpoint. 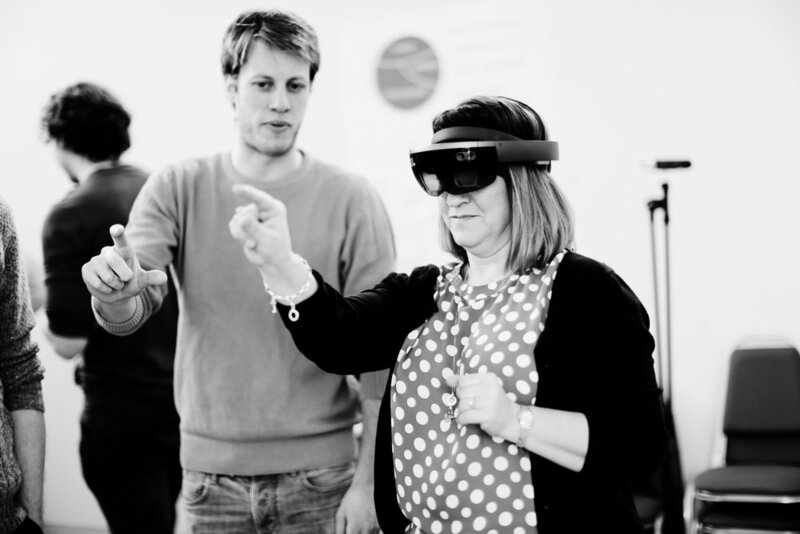 This activity was intended as a way of highlighting tensions between "The Board", nursing staff and patient, as well as a way of allowing other participants from a technology perspective to gain understanding of the context their technologies could be applied. Each industry partner had time to present their product(s) to the participants in small groups. 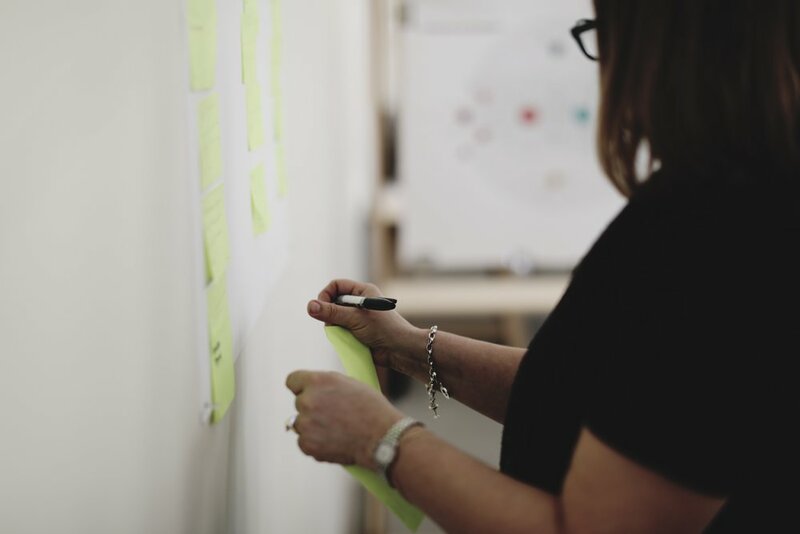 Positive and potential ideas and concerns were captured by participants and facilitators using Post-it notes grouped for each industry partner. 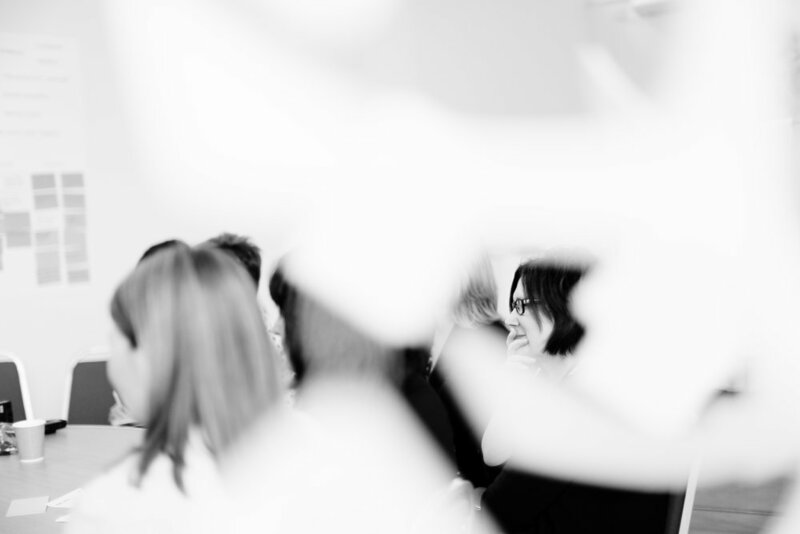 Two speakers were invited to widen our perspective and give insight from similar situations. 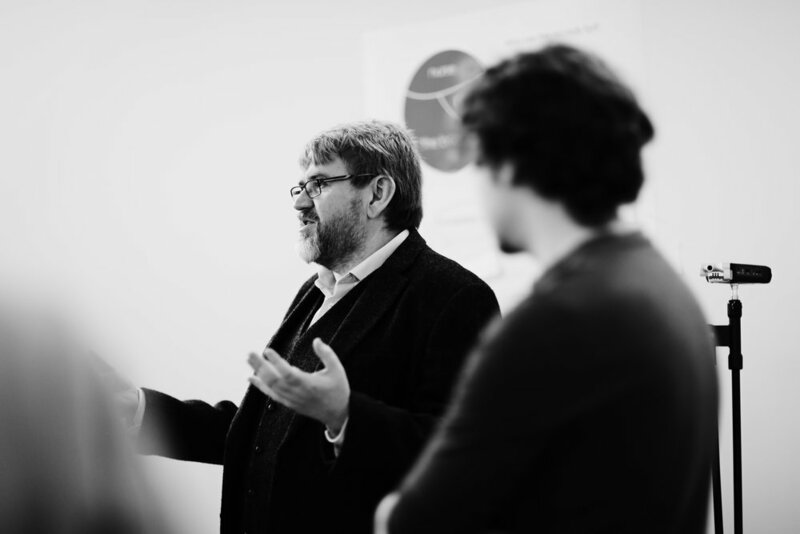 Andrew Fowlie and Dr Jamie Hogg gave short talks during the event. Dr Jamie Hogg talked about the transition to and benefits of using electronic records at a GP practice. Andrew Fowlie presented the views of the Scottish Government on funding and innovation in healthcare. An oyster map as shown below was suggested as the first tool which is a simple map to set broad aims for change. The template prompted participants to discuss what the desirable change is and what magnitude of change is required – e.g. 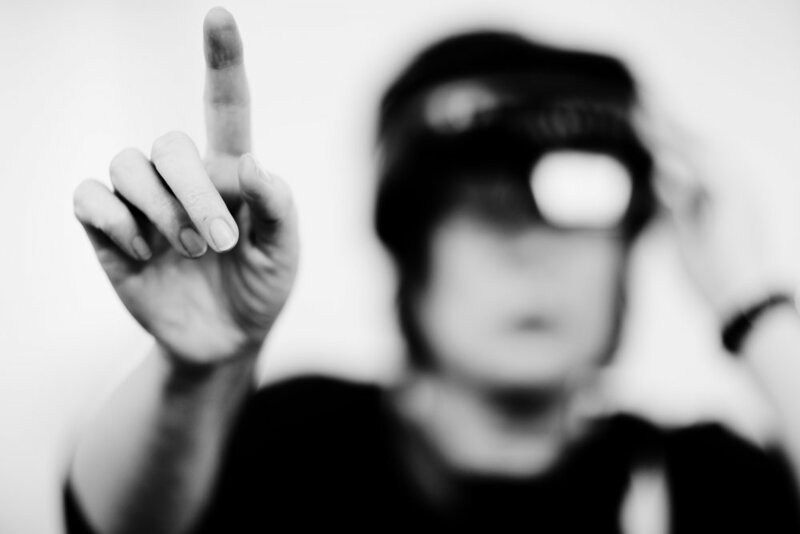 small changes to technology or fundamental change to training, technology and process. 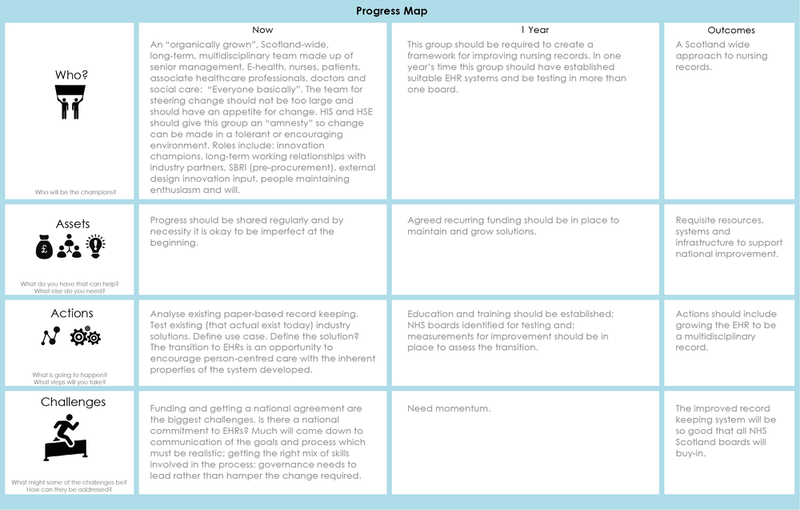 A progress map then provided more structure in a grid format and prompted participants to consider the current state, where they would like to be in one year and what they would like to achieve overall. 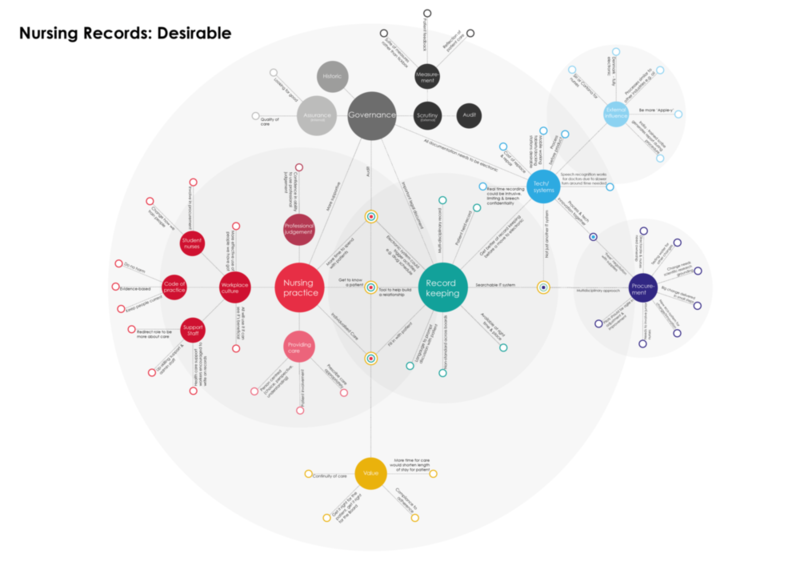 The map broke this down into four categories of Who, Assets, Actions, and Challenges. 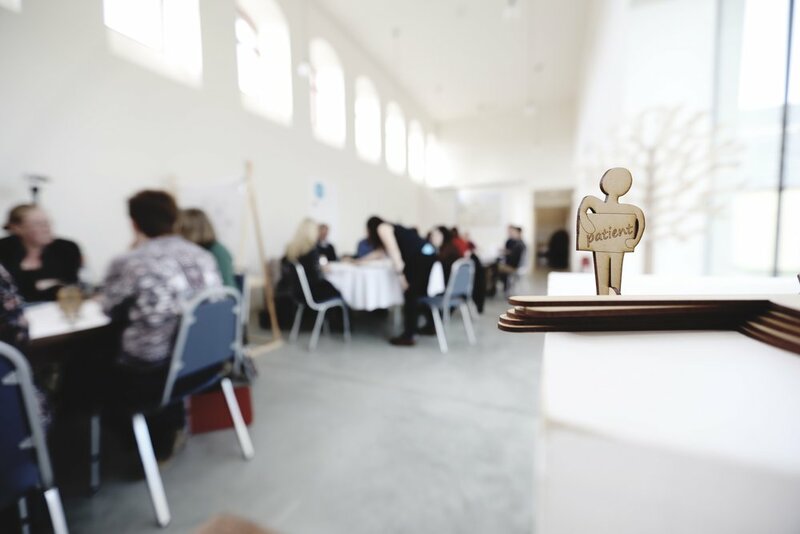 An oyster model tool used in the Experience Lab by participants to discuss broad aims for change. Wooden flag props were also provided at the end of the session to those who wished to champion a topic and take it forward, i.e. becoming a flag bearer. 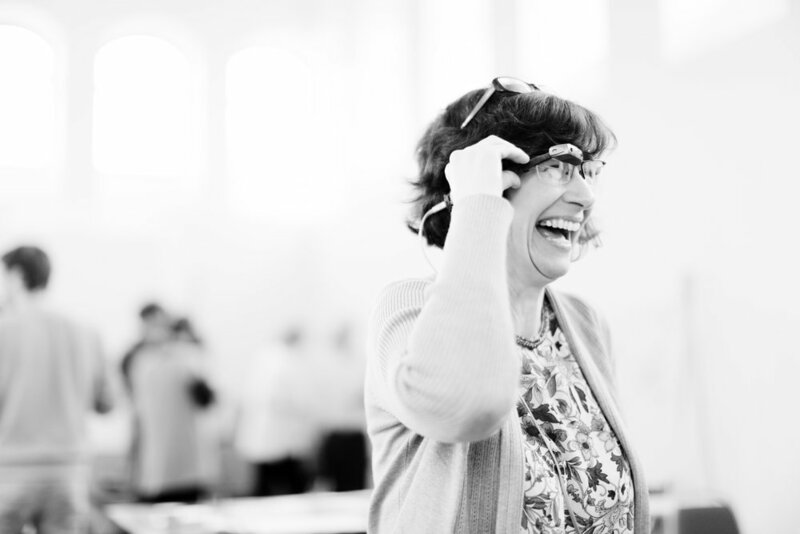 The visualisation captures the insights gathered from the series of ten interviews undertaken by the researchers with senior nursing professionals across six health boards in Scotland and features direct quotes to illustrate certain points. 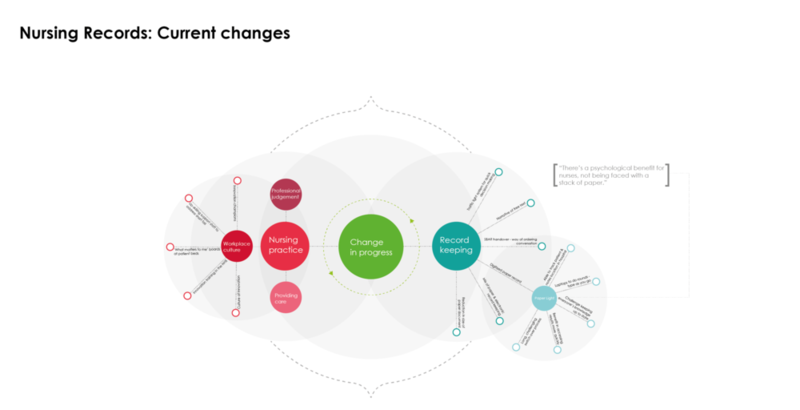 There are three parts to the visualisation, which describe the current issues discussed, what is currently undergoing change and what a desirable future nursing record might look like. The themes are further discussed in the detailed findings if you would like more detail. 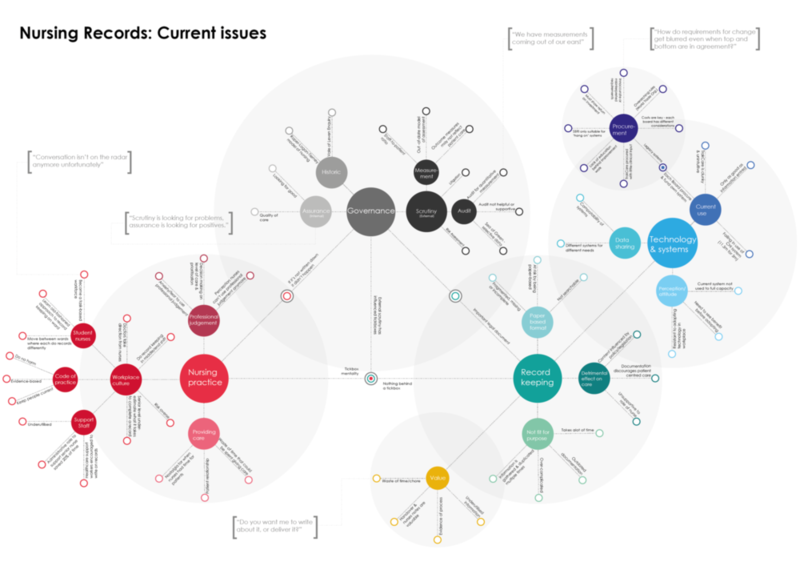 We would encourage you to use this visualisation as a tool for discussion rather than static information and it is available to download. A desire to move to electronic health records (EHRs) that were interoperable with the current system of TrakCare was of clear importance. 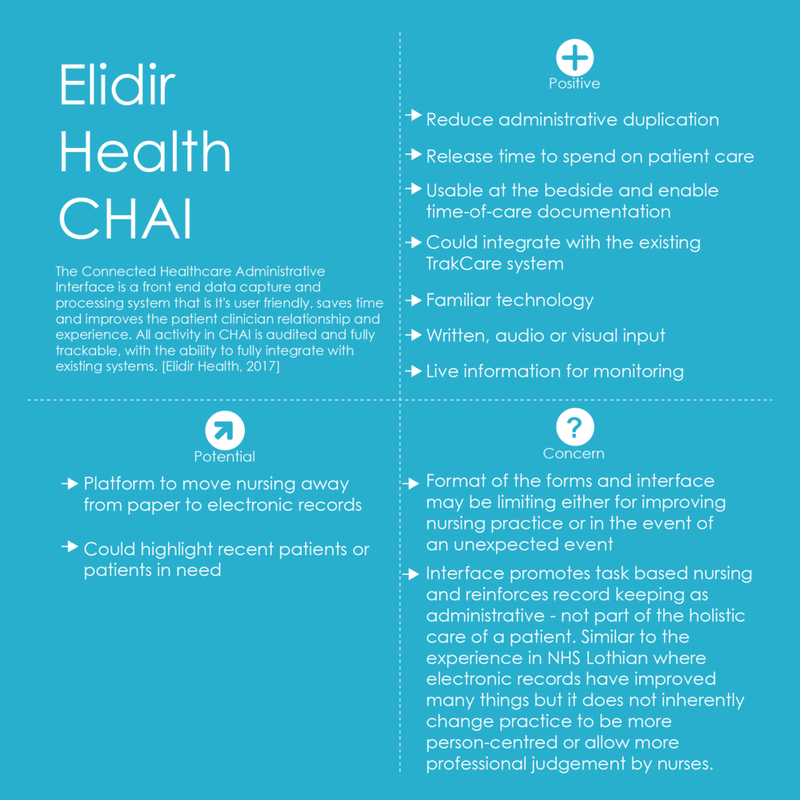 Elidir Health's CHAI system was presented as a good example, however it was noted that CHAI is a very process focused system rather than being more person-centred. 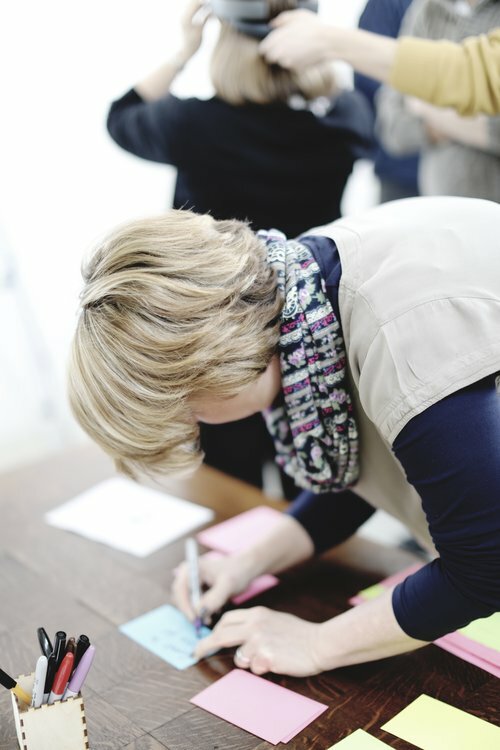 Alongside the development of EHRs, participants highlighted a need to increase the amount of professional judgement nurses can bring to care as opposed to too many mandatory forms and task-based working that can have a detrimental impact of patient care. Restructuring of the record keeping process which reflects how nurses work and supports them in delivering patient care. 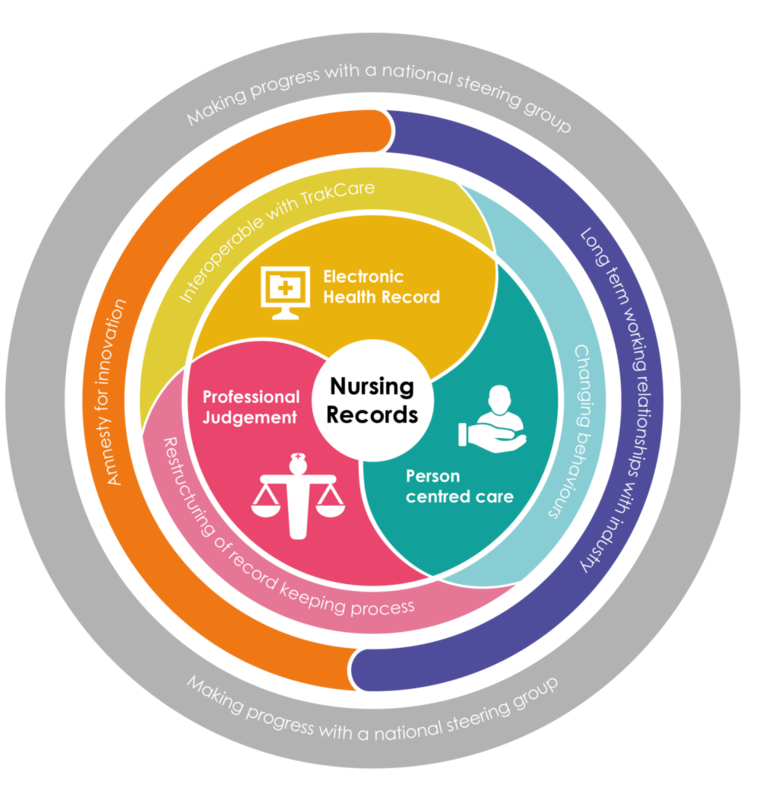 Ongoing work should continue to make the nursing records more person-centred through supporting a move to a multidisciplinary record that is centred on the patient as a whole. In order to procure a system that reflects the above requirements, long-term working relationships with industry partners are recommended. “One-shot” procurement should be replaced as much as possible by pre-procurement working with industry and ideally with long-term working relationships. This would ensure the industry partner fully understands the requirements and can adjust according to need. 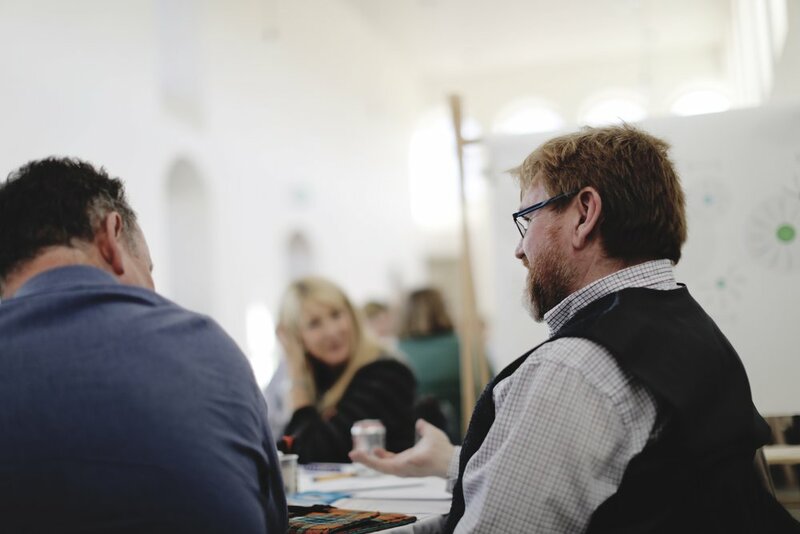 Participants recognised the magnitude of change required is high and expressed a need for a steering group that could address the above points at a national level. 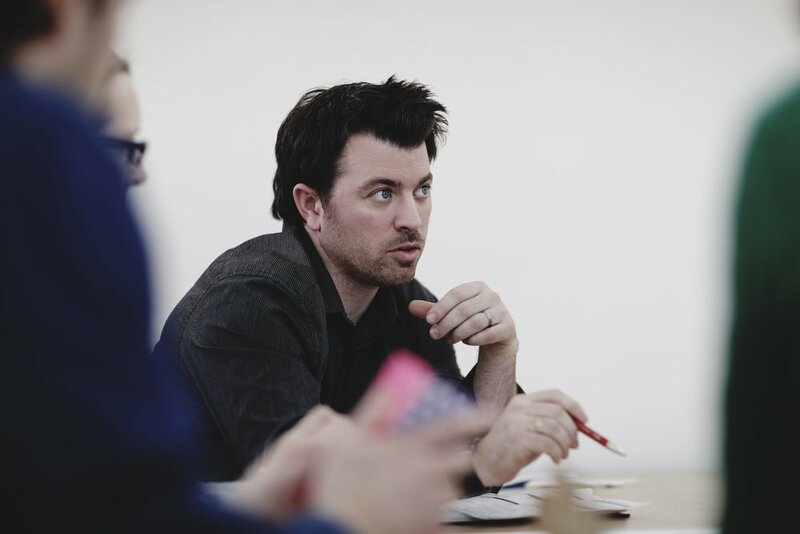 An amnesty for innovation was discussed as a way of providing protected space and time in order to trial and ideate new processes and documentation without fear of scrutiny from external bodies. 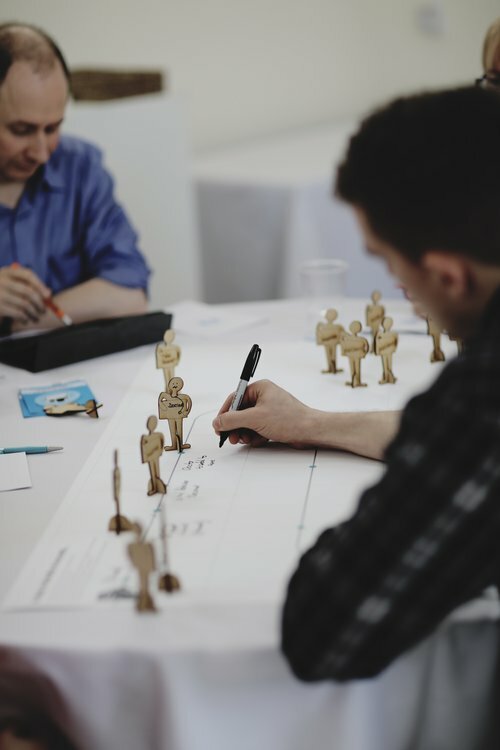 These are the findings from the 10 interviews and Experience Lab design workshop. This is not an analysis of how the findings fit with Scottish health strategy. Nor have we attempted to interpret the findings from the point of view of NHS Scotland. The findings are presented as opinion from the interviews and the Experience Lab and are not corroborated by sources outside of these activities. That is, the statement of fact below is supported only by the activities within this project. 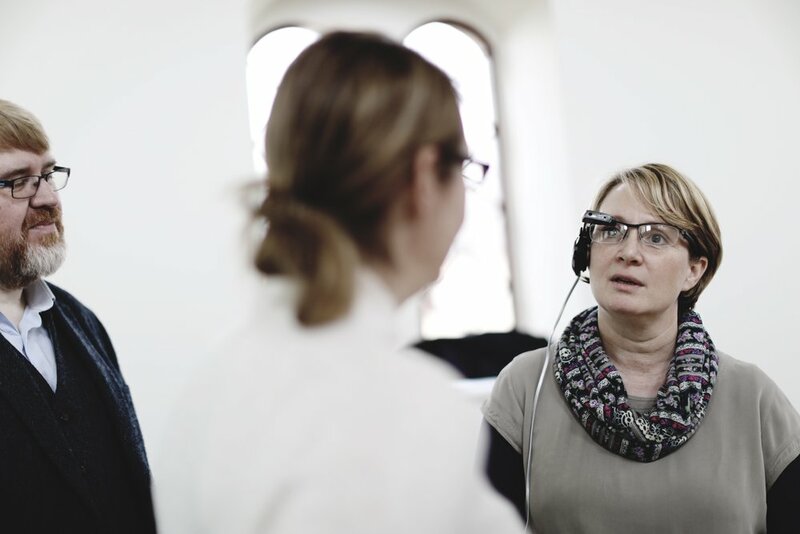 Internal contradictions between interviewees and/or participants are left in place where they exist. The findings are particularly focussed on the role of technology and how to make progress. 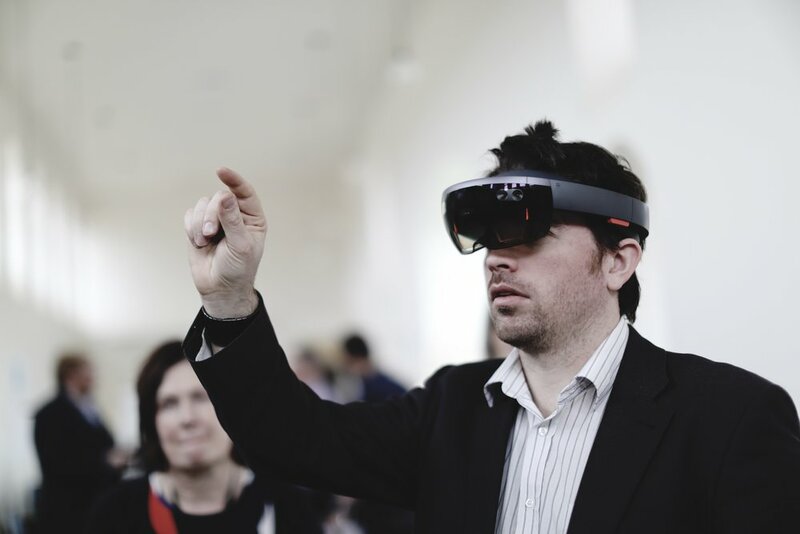 Here are the positives, potential and concerns about each of the technologies demonstrated at the Experience Lab. These were written down by participants and Experience Lab staff during the demonstration. 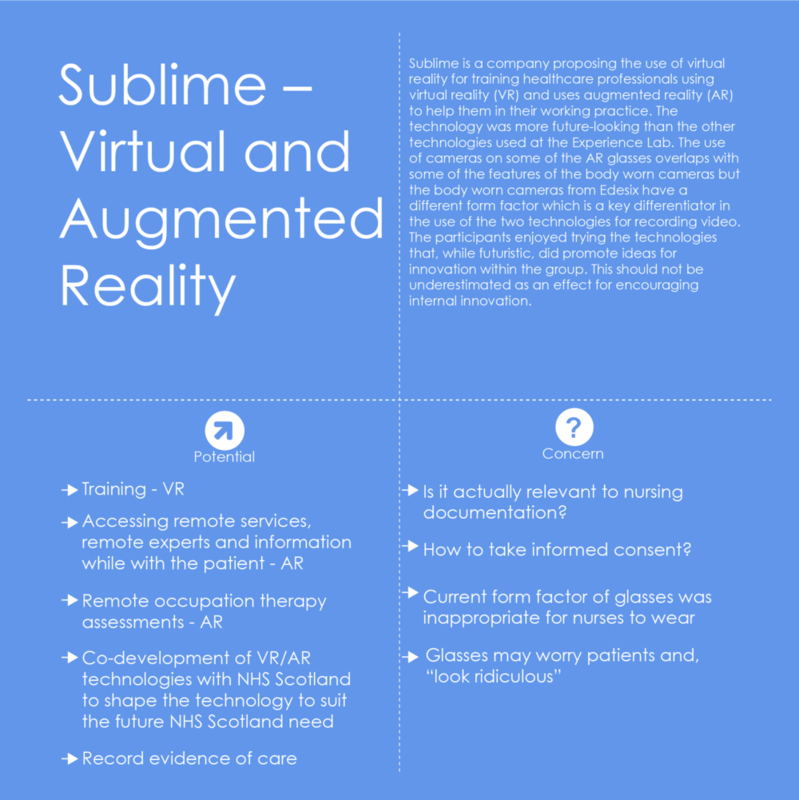 Sublime - Virtual and Augmented Reality shows no positives because each of the recorded positives was actually a potential use. The participants' thoughts on how to make progress. This is a digitised conglomerate version of two such printed sheets filled out during the Experience Lab. [Ariel et al., 2016] Contagious Accountability. Barak Ariel, Alex Sutherland, Darren Henstock, Josh Young, Paul Drover, Jayne Sykes, Simon Megicks, Ryan Henderson. Criminal Justice and Behavior Vol 44, Issue 2, pp. 293 – 316. 2016. 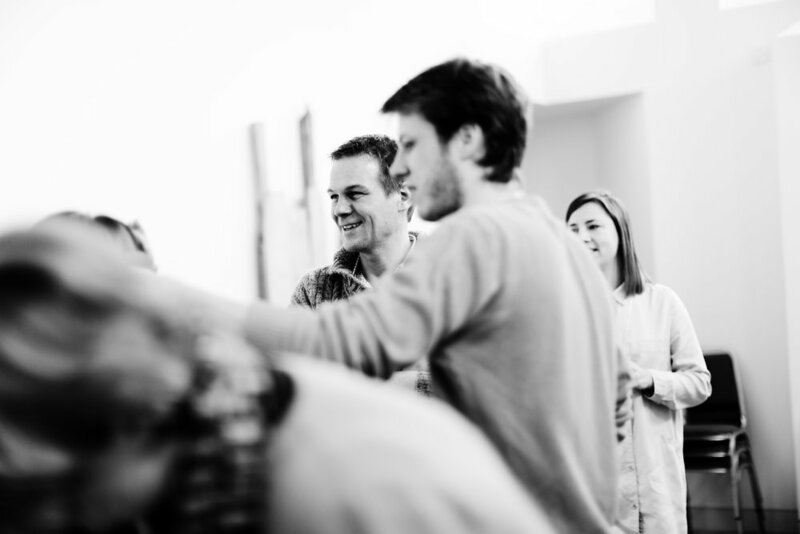 [Edesix, 2013] The Resuscitation Research Group Edinburgh. 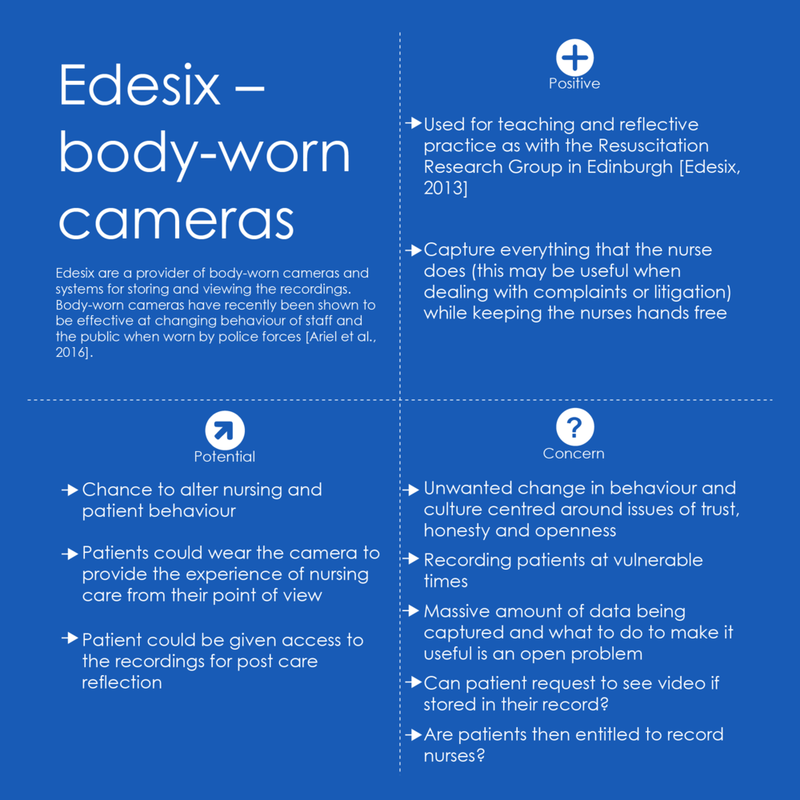 Accessed at https://www.edesix.com/industry-solutions/case-studies/the-resuscitation-research-group-edinburgh on 21/05/17. [Innovation Cluster, 2016] Patient Safety & Records Management Workshop. Accessed at http://www.in0v8.scot.nhs.uk/wp-content/uploads/2016/10/Patient-Safety-%5E0Records-Management-Workshop-Final.pdf on 15/05/17. [InterSystems, 2017] TrakCare. Unified healthcare information system. Accessed at http://www.intersystems.com/our-products/trakcare/trakcare-overview-2/ on 18/05/17. 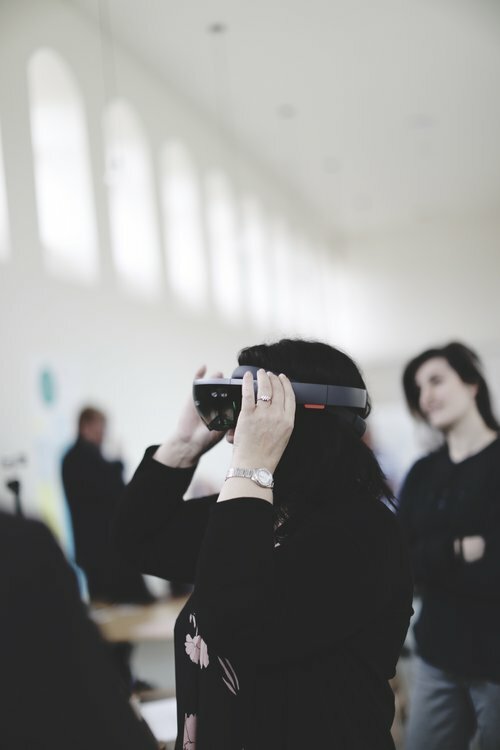 Written by Dr Jay Bradley (j.bradley@gsa.ac.uk), Research Fellow, Glasgow School of Art and Angela Tulloch (a.tulloch@gsa.ac.uk), Research Associate, The Innovation School, Glasgow School of Art. July 2017. 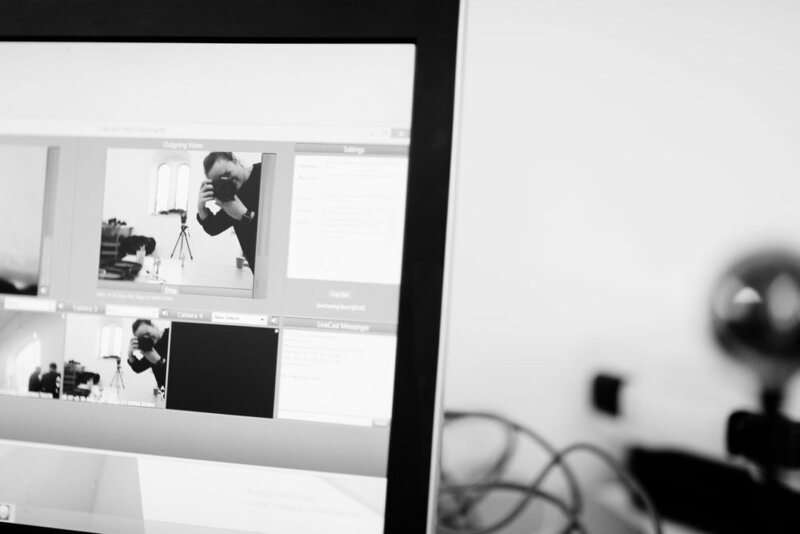 Photography and video by no middle name. This publication is copyright. Apart from any use as permitted under the Collaboration Agreement no part may be reproduced in any form without written permission. This document has been prepared in good faith on the basis of information available at the date of publication without any independent verification. The Digital Health & Care Institute (DHI) does not guarantee or warrant the accuracy, reliability, completeness or currency of the information in this publication nor its usefulness in achieving any purpose. Readers are responsible for assessing the relevance and accuracy of the content of this publication. The DHI will not be liable for any loss, damage, cost or expense incurred or arising by reason of any person using or relying on information in this publication.